Nominations close on 13 May 2019. 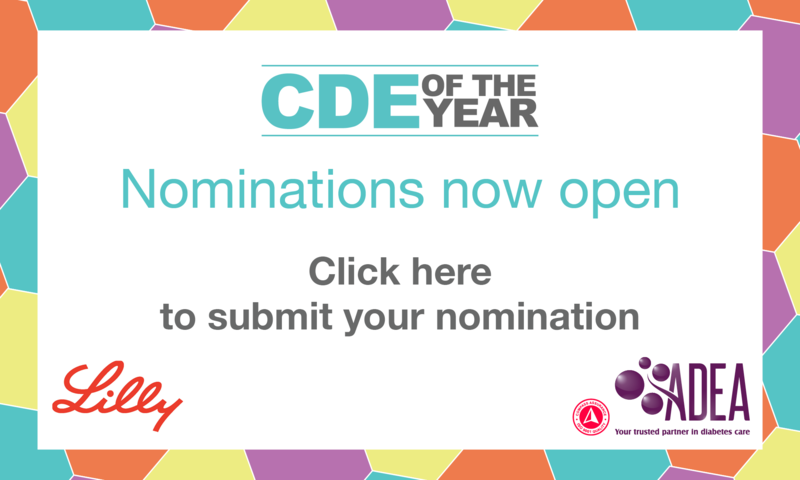 Nominate your Credentialled Diabetes Educator for the CDE of the Year award program. Does your CDE go out of their way to help you? Do you feel empowered and confident after a visit to this CDE? Do you describe your CDE as being outstanding? Credentialled Diabetes Educators (CDEs) are Australia’s ‘go to’ qualified healthcare specialists for people with diabetes. They are healthcare practitioners qualified to provide a personalised approach to diabetes education and care. They work with other healthcare practitioners and provide services to people with diabetes, empowering and assisting them in dealing with daily self-management. Recognition as a CDE is an assurance to you that these healthcare practitioners will provide high-quality diabetes education and expert advice to help people with diabetes do the hard work of staying well every day. The CDE of the Year award program is designed to recognise and honour outstanding achievement and contribution of CDEs in the provision of high-quality diabetes education and expert support for people living with diabetes. This award program is run by the Australian Diabetes Educators Association and financially supported by Eli Lilly. Each state and territory will have a winner and from this group, a national winner will be selected to receive the prestigious ‘Jan Baldwin National CDE of the Year’ title. State winners will receive a $1,000 scholarship and the national winner will receive $5,000 scholarship and the opportunity to speak at the 2020 Australasian Diabetes Congress. How can people with diabetes submit their nominations? We accept nominations from people with diabetes and this year we use the same nomination template for both health professionals and people with diabetes. Are there hard copy forms people with diabetes can complete? Or how do they access the online nomination process? It would be best if all nomination forms are submitted via our template on SurveyMonkey so that we can manage them better. Do people with diabetes have access to the ADEA website? All of these pages are publically available. How do we alert people with diabetes to the nomination process? It’s best if you can share information about the award program to your network of people with diabetes, peers and colleagues. The best webpage is https://www.adea.com.au/about-us/cde-of-the-year where they can find the process, nomination form and sample.